If you are craving an authentic tonkatsu sandwich in Japan, make your way to Ginza Bairin 銀座梅林 to try Tokyo’s first tonkatsu specialty store. 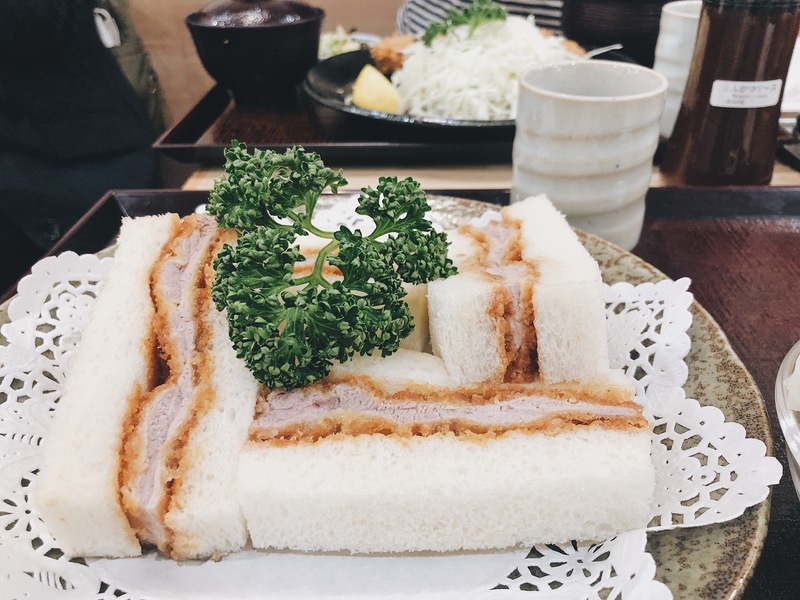 Tonkatsu sandwiches, nicknamed katsu-sando, are fluffy sandwiches stuffed with a juicy cut of fried pork. Different stores drizzle different sauces in the sandwich and at Ginza Bairin, the sauce has a subtle sweetness to it with hints of a tart mustard. My friend Maggie & I were shopping in Ginza one day when we decided to grab a light lunch. Having tried Maisen in Omotesando and Tonki in Meguro (both great tonkatsu stores! ), we were suddenly craving… a tonktasu sandwich. Founded in 1927, Ginza Bairin is a classic among Japanese locals. The lunch sets are great value for money and the storefront, despite being in the heart of Ginza, is casual and welcoming. We dined with a lot of locals there on their lunch breaks and enjoyed the light chatter around us. I’m a bit picky with my katsu-sando and find that they are often over-powered by their sweet sauces. But at Bairin, the katsu was a tender cut of kurobuta and only lightly brushed with tonkatsu sauce. Topped with a nice tartness to it from the mustard, Bairin’s katsu-sando was so simple yet satisfying. Note that the original Bairin Honten is closed for building reconstruction until Spring of 2021. Until then, the store is relocated to a new location close by. Fortunately, the once massive crowds have yet to find their way there! Lines are not long during weekday lunch time (~20 minutes). Service is still quick and efficient, with plenty of English menus to share. So next time you’re in Ginza, definitely swing by for a katsu-sando at Bairin before doing some shopping. There may be better tonkatsu in town but Bairin’s katsu-sando is a classic. Simple, no-frills, and delicious.